Australia's selection as a maintenance, repair, overhaul and upgrade hub for F-35 avionics and aircraft components is seeing the rapid transformation of the aerospace precinct at Williamtown as both the national and regional hub supporting all of the fifth-generation aircraft operating throughout the region. BAE Systems Australia director aerospace and integrated systems Steve Drury said, "We are excited to support the Australian and regional JSF program with the most advanced sustainment services available, ensuring the F-35 is prepared and ready to be deployed anytime, anywhere." The portfolio of F-35 sustainment activities at Williamtown will see about 400 jobs created over the next 10 years and a continuing requirement for this level of employment for the 30-plus years outlined as part of the contract. "We have a small team already working to support F-35 activities, including a group of technicians who are currently training in the US. When all of Australia’s aircraft are delivered, BAE Systems will support up to six dedicated F-35 maintenance bays employing around 100 people," Drury explained. BAE Systems aerospace support facilities at Williamtown have grown around the company's role supporting the RAAF's lead-in fighter, the Hawk, with technicians originally tasked with supporting the Hawk program transferred to the F-35 program earlier this year. As part of the 13-week training regime, the mechanical, avionics and structural technicians and qualified instructors from BAE Systems worked alongside Lockheed Martin F-35 subject matter experts and mentors at the Lockheed Martin F-35 production facility training centre in Fort Worth, Texas. BAE Systems Australia chief executive Gabby Costigan said at the time, "This is the first step in creating a depot capability in Australia. Our mechanical, avionics and structural technicians will be trained at the facility where the F-35 is designed and built. This training will ensure they have all the necessary skills to provide the very best support for the Royal Australian Air Force." Sustainment activities will also create opportunities for BAE Systems Australia's local industry partners and supply chain. Drury said, "We’re focused on using our role as an industry leader to deliver the best outcome for the customer and industry partners and to build Australian industry capability." Supporting the BAE Systems Australia operations in Williamtown and the global F-35 supply chain, the company has invested more than $15 million in facilities and equipment to establish a titanium machining facility in Adelaide to manufacture F-35 vertical tail components. These titanium machined vertical tail parts are then supplied to an Australian family-owned engineering firm Marand in Victoria, which assembles and exports them to the UK. In 2017, BAE Systems Australia delivered more than 1,700 titanium parts into the F-35 program through Marand. 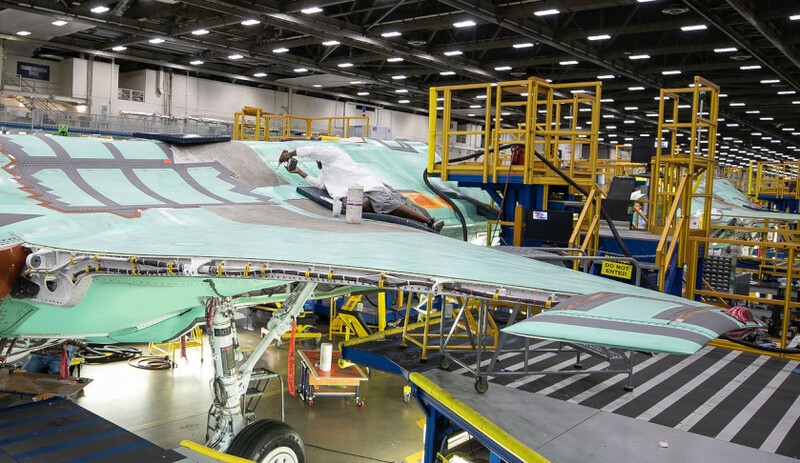 Currently, 300 components for the F-35 vertical tail are being produced per month. Costigan expanded further at the time, saying, "The expanded machining facility and our highly skilled Australian workforce will help us to secure new opportunities in defence or commercial sectors. It has also provided significant opportunities within our Australian supply chain as we will be supplying parts into this program for the next two decades." Australia’s defence industry has directly shared in more than $1 billion of production contracts since the government committed to the program in 2002 and is a key industry partner and supplier, fully integrated into the global supply chain that supports the F-35 program.